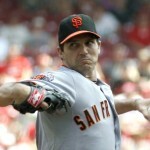 Barry Zito is a pitcher for the San Francisco Giants and spent seven years with the Oakland Athletics. For someone earning around $19M a year, this Range Rover is pretty standard, although it does have an air of sawn-off shotgun and drug dealer about it. I think the whole package is too standard, and whilst the rims are okay, there are way better available. 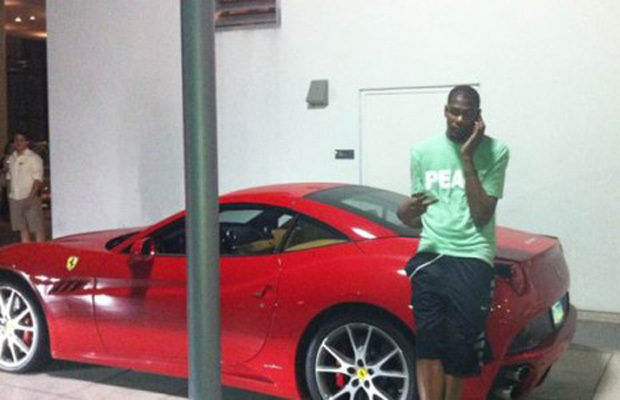 Like most athletes, what they drive around in matters, and this is defiantly the case when it comes to the NBA. 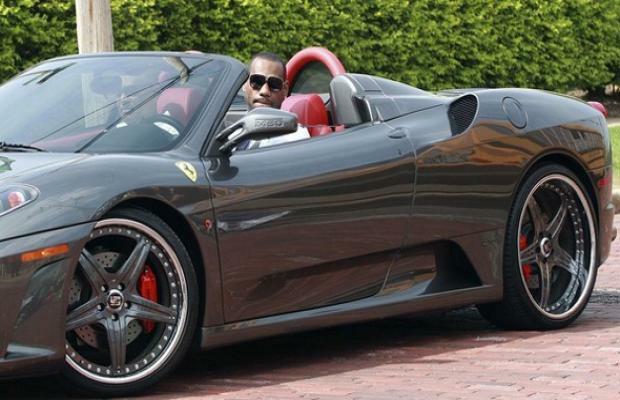 Ballers are responsible for the most diverse and eclectic collection of cars in the sports world. From Donks to 4X4s, you’ll find them all here, and being taller than the average male doesn’t stop ballers from buying small and sporty either. Here we see Golden State Warrior Stephen Curry II with his pimped out Mercedes G-Wagon. 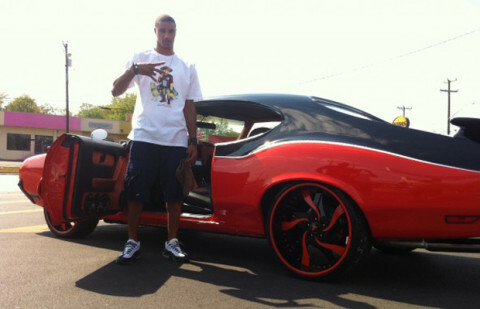 Considered one of the greatest shooters in the game, this baller thinks big when it comes to his rims and ride. Kevin Wayne Durant is a forward for the Oklahoma City Thunder. 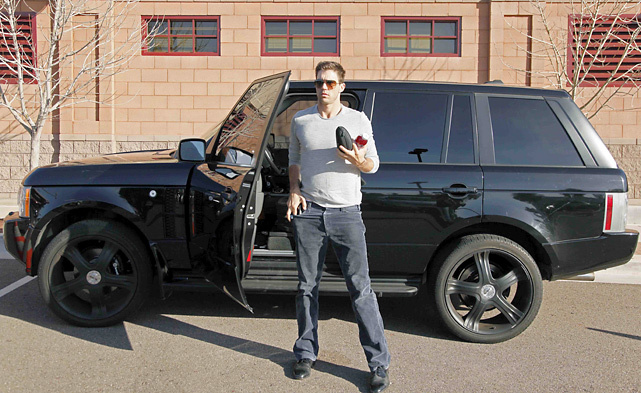 This Olympic gold medalist and former Rookie Of The Year has chosen one of Ferrari’ finest with the California. George Hill, Jr. is the Indiana Pacers’ points guard with an obvious creative streak. This is what happens when an athlete and a vision is bought into reality. I’ll leave you to decide whether it’s a good vision or a nightmare. Chris Andersen, aka “Birdman” is a center for the Miami Heat with a slightly different vision. 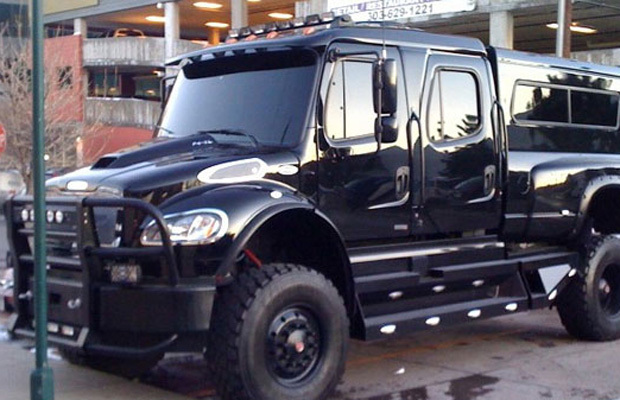 This monstrous International was customized by Car Toys in Denver, CO. Matching it’s imposing presence, it sits upon 22.5″ black wheels. Big truck for a big guy. Miami Heat forward LeBron James has a Ferrari F430 convertible. It’s nice to see a Ferrari that isn’t red, and not only that, the after market rims actually suit this car – for an athlete this is even more remarkable. 6′ 11″ L.A. Lakers center, Dwight Howard certainly needs leg room when it comes to his cars. 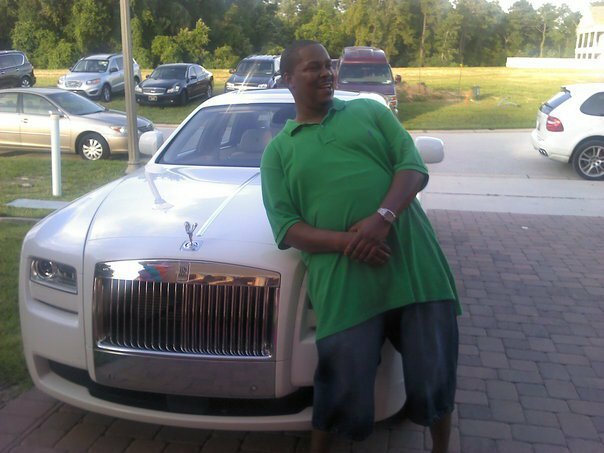 What better way to transport that 270-lbs torso around than in this silver white Bentley Mulsanne? Marc Gasol Sáez is a Spanish center for the Memphis Grizzlies. 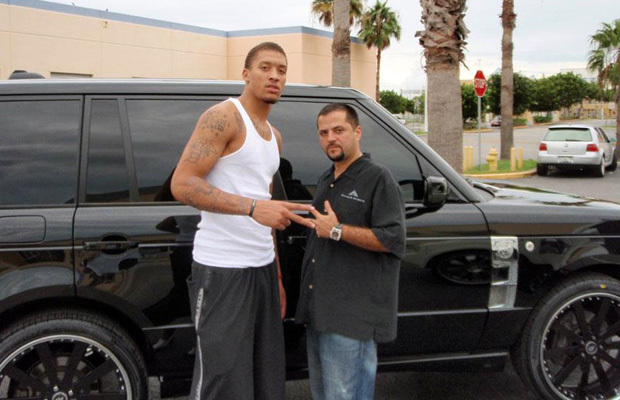 2012 NBA All-Star and 2013 NBA Defensive Player of the Year, Grisol owns a rather reserved yet stylish Jaguar XK. Miami Heat Michael Paul Beasley, Jr. plays both forward positions for the Miami Heat due to being ambidextrous. 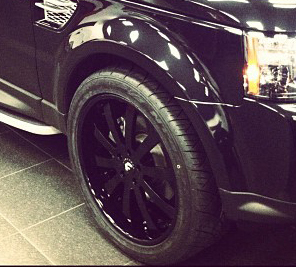 Beasley loves black on black as seen here on his Range Ranger. 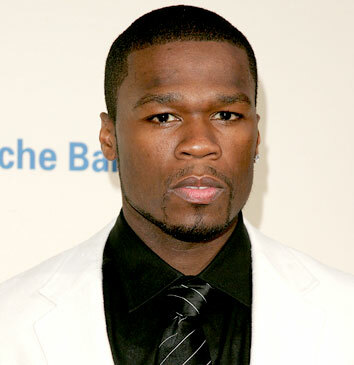 He also has a black on black Bentley Flying Spur. James Harden is a shooting guard for the Houston Rockets and a 2013 first-time All-Star. His beard is almost as impressive as his yellow Chevrolet Camero. 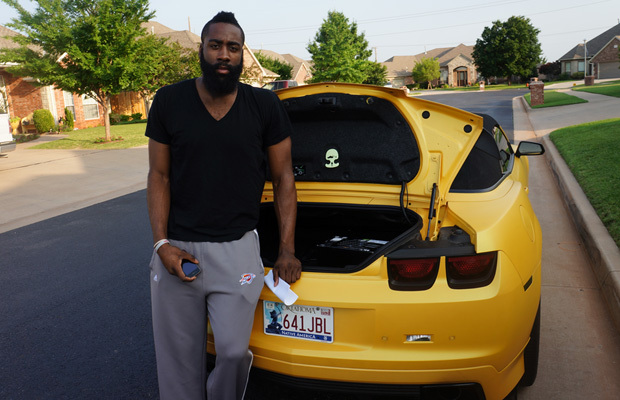 A fan of making an impression, Harden also has a murdered-out Range Rover and an all white Mercedes S Class. 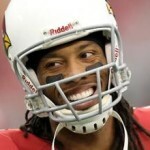 It’s said that if Arizona Cardinal Larry Fitzgerald had the right quarterback, he’d be one of the best receivers in the NFL. Despite this being out of his hands, he has a few other things he can control. 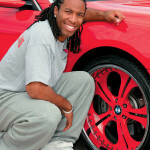 Pictured here with his livery is Fitzgerald’s red BMW 7-Series with matching custom rims. Along with a standard S Class and Range Rover is a powerful SL550. Fitzgerald also recently appeared in a video at drewsgarageonline.com with his newly completed 68 Shelby Mustang – as soon as we have more pictures we’ll upload them. Kendall Jenner is following the foot steps of her sister Kim Kardashian. 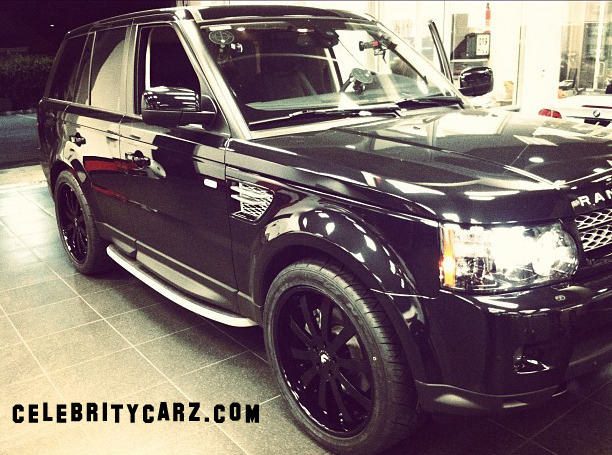 Kendall just customized her black Range Rover Sport at Calabasas Luxury Motorcars. The car is staggered on Forgiato Concavo wheels, painted all gloss black. 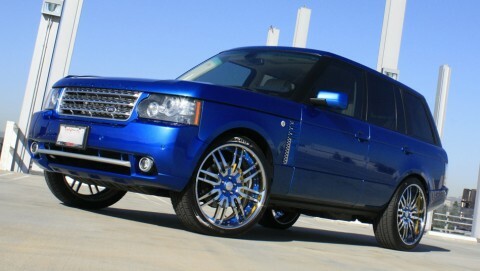 Great choice of wheels for this Range, a 10 spoke wheel is a really good look. If you want to see more of this car, tune into E! where you can see her driving it around on Keeping up with the Kardashians. 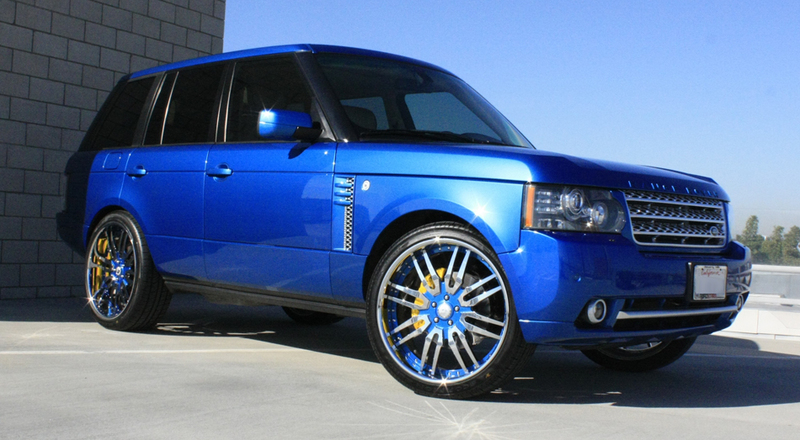 This is 50 Cent’s Custom Blue Range Rover that was customized by Roadstarr Motorsports in Los Angeles. The car was painted a custom electric blue and really stands out from any other Range Rover in the streets. The car is equipped with 24″ Forgiato Sedici wheels that are custom painted chrome and blue. The tire size is 295/25/24 all around. Love the color choice and the choice of wheels, both style and size. The only comment on this car that I have is that I wish they would have went with a nice chrome grille to match with the rest of the car. He could have put one of the new Forigato grilles or even a chrome Strut grille would have looked awesome. It would be even nicer if the grille was painted chrome with some color matched blue paint on it. Other than the grille, this is a near perfect build on a Range. MC Customs in Miami built King Felix of the Seattle Mariners another car. There is no doubt about it, this one is a perfect 10. There are so many little details that went into this build, it is really a rare perfect build. 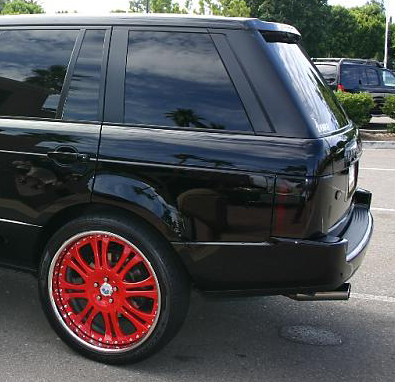 The best part about this Range Rover is the custom built 24″ wheels. These wheels are truly custom. 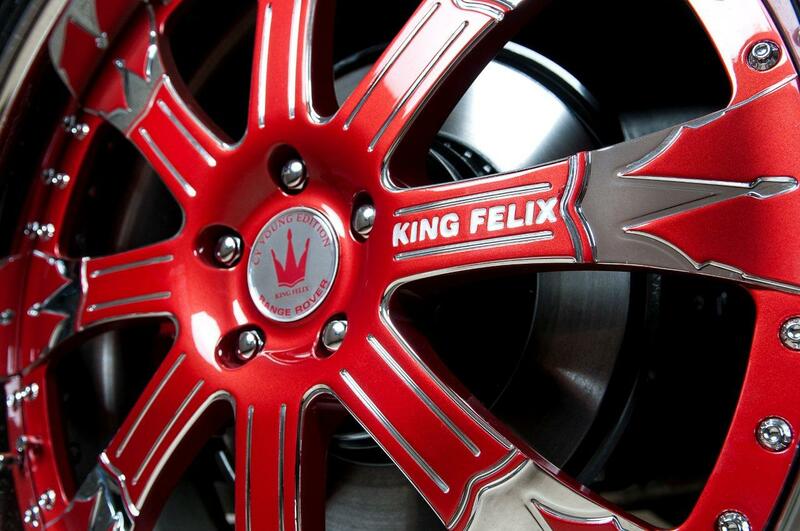 Each one of the 8 spokes has a chrome crown designed into it and each wheel says King Felix on it. The center caps are also customized with his crown logo and they are floating caps! I love the way they painted red inside of the head lights. The chrome strut grille really makes up for the lack of chrome moldings and flows well with the chrome on the wheels. 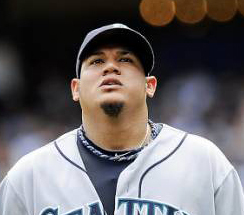 The interior is completely custom with the King Felix Crown stitched into the headrests. It also has a top of the line sound system to put it all together. Superstar athelets take notes, this is how it is done. Find the best custom shop in your city, drop off the keys and leave them a blank check and let them do what they do best. This is Ryan Sheckler’s Black Range Rover HSE. 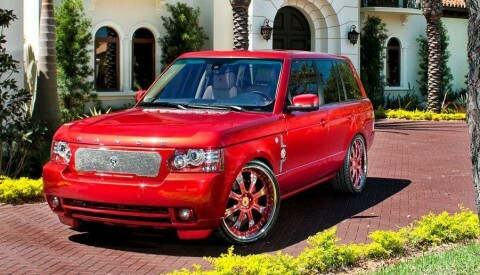 It has 24″ red Asanti wheels, tinted windows, blacked out lights, and a custom painted red grille. This is about as bad as you can make a Range Rover look. This car is horribly customized. I like taking chances with your car but this just doesn’t make sense. It looks like the grille and the scoops on the hood were just spray painted red. The tints on the front head lights are too dark. I would give this car a 1 rating but I will take it easy on the professional skate boarder beacause he looks like he is 16 and this is his first car. He still has time to step his car game up. 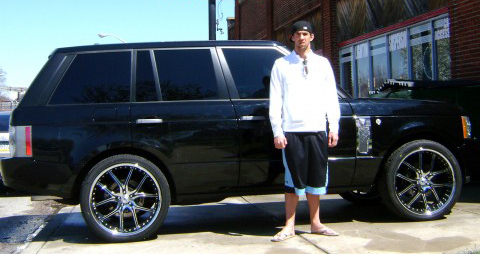 Here is Michael Phelps in front of his Black 2009 Range Rover Sport HSE. This Range is sitting on 24″ chrome and black Asantis. It is also equipped with the full Asanti grille kit. Just like his black SL, Phelps brought his car to No Limit Inc in Baltimore, MD. It looks like they gave him a perfect fitment on this car. Although the wheels are 24s, the tires actually have some good height on them. I’ve seen these exact wheels in 26″ on a Range Rover and it is a complete joke. It would be a matter of hours until you bend the wheels.